Watch 6 minutes video to quickly get an idea of our software. Pause the video if required. You can store patient data and encounter simultaneously. Data can be chief complaints, history, vital statistics, physical examination findings, investigations, diagnosis, drugs, advice, clinical image or other documents etc. Our software is completely Template Based. This means you can pre-set all the components of a prescription. This will save time during data entry. One click Duplication of previous encounter data. Say you want to continue all the previous drugs with slight modification. So you have to manually entry all the drugs right? Oh No! 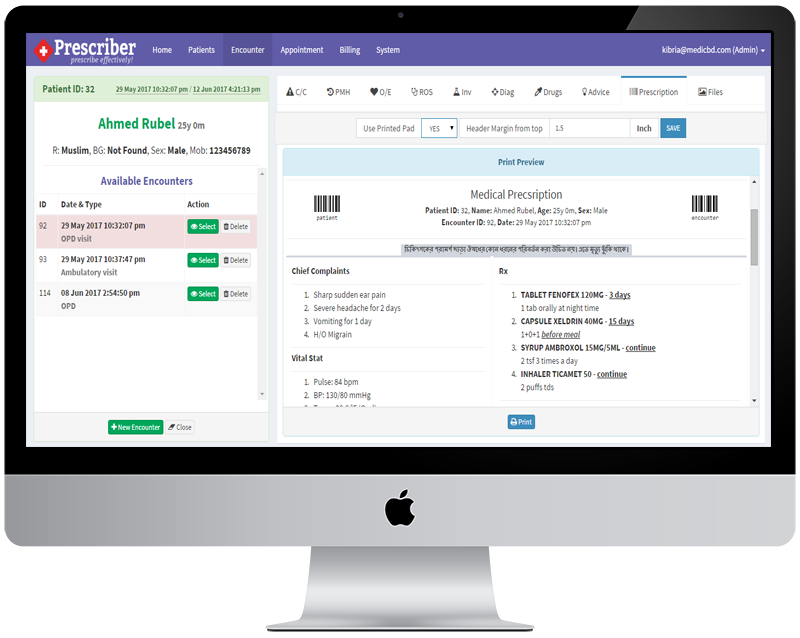 With our software, you can duplicate all the previous drugs by One click. This will save a huge amount of your valuable time. You need to see previous record right? It is just one click away. all the prescriptions generated are Barcoded. Search Quickly by barcode scanner or manually. You can setup chamber information where you practice. Each chamber you create will get a panel where your assistant can do things on behalf you (Like patient registration, appointment booking, document store etc). Setup weekly schedule of your chamber. This will update your chamber time accross our platform. Generated Prescription will meet BMDC instructions. We will not charge you anything for getting started. It is totally FREE forever. Our software is Only for BMDC Registered Doctors. You must prove that you are a BMDC Registered Doctor of Bangladesh by sending required documents to us. Prescriber® requires Internet to operate.